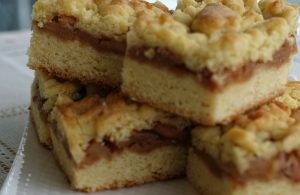 This European Apple Cake recipe has been shared with me by a friend of mine, and she calls it “Sharlotka”. The cake part resembles a shortbread cookie, and the filling consists of sautéed apple slices, flavored with sugar, lemon juice, and cinnamon. The topping is a shredded, chilled cake dough, saved from the batch used for this cake. This is a very easy recipe to prepare, and the finished product presents itself very nicely. Since it is a 9 x 13 inches sheetcake, it can be cut into 18, or more serving pieces. In a large mixing bowl mix butter and sugar, until incorporated. Mix in egg yolks, one a time. Add vanilla extract and lemon zest. In a small bowl mix the flour, salt and baking powder. Using a paddle attachment, gradually mix in the flour, until a soft dough forms. Remove 1/3 of the dough, and chill in the fridge to be used for topping. Line a 9 x 13 cake pan with parchment paper, and grease well bottom and sides. Spread evenly the 2/3 of the dough over greased paper and press it down evenly with your fingers. Spread cooled apple filling over the dough, and smooth it out. Using a large eye shredder, shred the chilled dough over the apples, to form a topping. Bake in a preheated oven at 350 degrees F, for 25-30 minutes, or until the topping is golden color. Remove from the oven, and cool in the pan. Peel, core and quarter apples. Cut each quarter into slices, cutting it across. Warm a large frying pan with butter, and saute the apples until wilted (about 10 minutes). Add the sugar, lemon juice, vanilla extract and cinnamon. Mix well to incorporate. Cool filling, before spreading it on the cake.